Memory Verse Text: There is therefore now no condemnation to them which are in Christ Jesus. 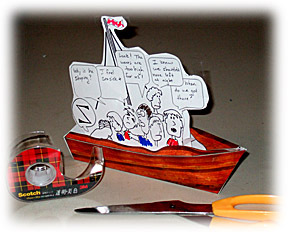 3D printable paper boat with Jesus and the disciples in the storm. Point 1: It was the Lord who suggested that they cross the Sea. He falls asleep - He truly was a man and grew weary from all His constant labour. Point 2: A great storm arose. Galilee is known for these sudden storms, but one would wonder if this were not an attempt by the Devil. This was a real storm. They were in jeopardy. Point 3: They came to HIM. A move in the right direction! Their cry is a little different in each account and allows us to understand in a fuller way all that was involved. Point 4: He told the storm to Hush as one would a little child. He is absolute Master of wind and wave and storm and the elements. Is He my Master? Have I heard Him? Do I obey His voice? Notes: He will never lead us where He cannot sustain us.